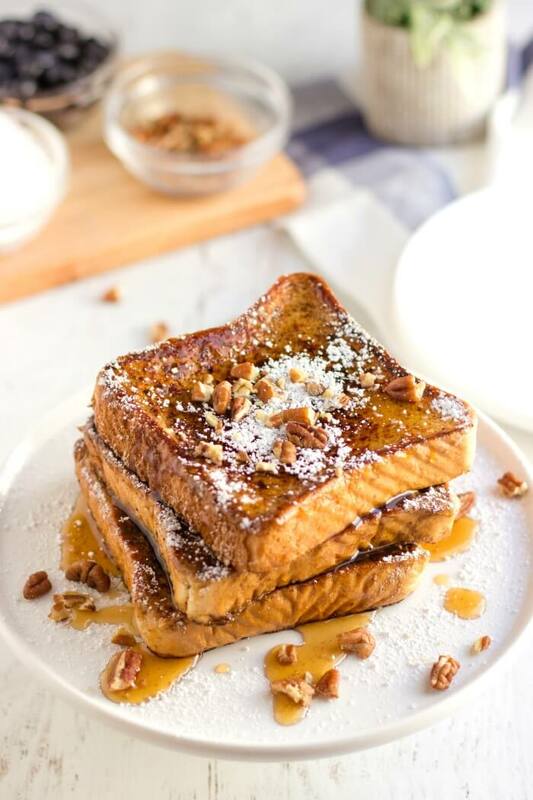 French Toast is a weekend treat at our house, and you’re going to love this recipe because it’s the Best French Toast you’ll ever make! French Toast is a favorite in our house. 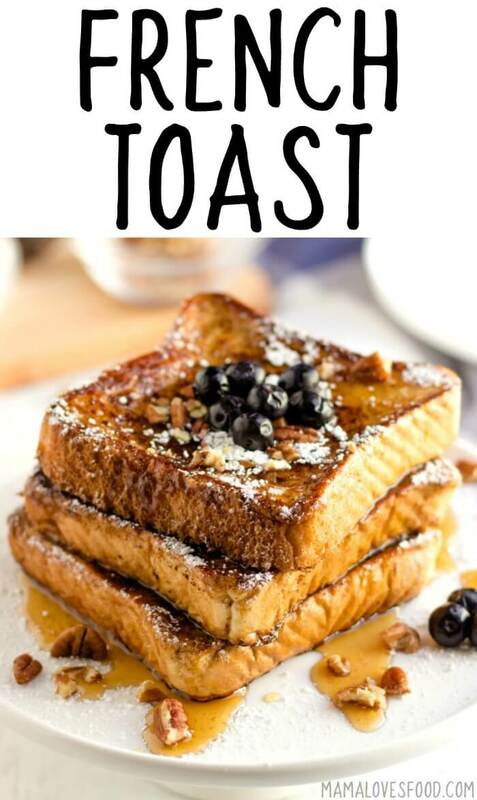 This French Toast recipe is easy to make and very delicious, try it once and it will become your Sunday tradition too! 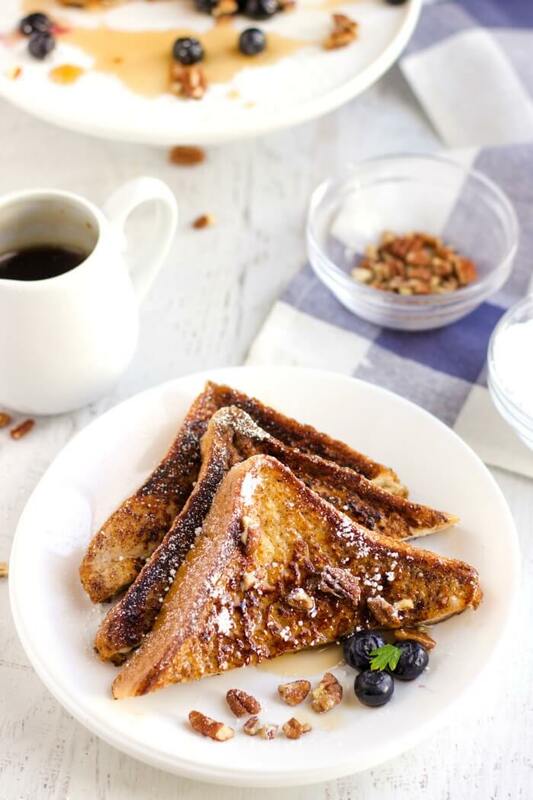 We like to serve our French toast with poached eggs, bulletproof coffee, and fresh fruit. Eggs – I use large or extra large eggs, so if you tend to purchase smaller sized eggs then you may need to add an additional egg to the batter. Vanilla – Make sure you’re using real vanilla. I know it’s gone up in price pretty substantially in recent years, but I find that it’s still affordable if I purchase it at a warehouse store like Costco. Also, it’s not something we use in our every day cooking, so I don’t mind the occasional indulgence in something a little more expensive. Cinnamon – Ground cinnamon for this, sometimes I’ll sprinkle a little more on top before serving too. Nutmeg – Some folks have strong feelings about nutmeg. I personally am a huge fan, I even add it to my mac and cheese and my pumpkin soup! But if it’s not your thing, you can skip it here. Sugar – My husband and I are diametrically opposed on this ingredient. 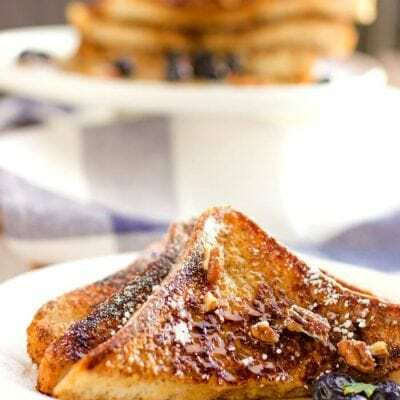 When he makes this French Toast recipe he skips the sugar (and in his defense, my kids still love it) – but I think French Toast should be slightly sweet, so I like the addition of a little brown sugar to the batter. If I don’t have brown sugar sometimes I’ll use powdered sugar. Milk – I strongly suggest using whole milk or even half and half or heavy cream. Lowfat and fat free milk will technically work, but the end result will have a much heavier egg flavor and won’t be as rich tasting. Bread – A hearty thick sliced bread is ideal for this recipe. You could even make a batch of our French Bread recipe or beer bread and use that (YUM). In a pinch regular sandwich bread will work too, just make sure not to soak it too long or it will get soggy and possibly fall apart. 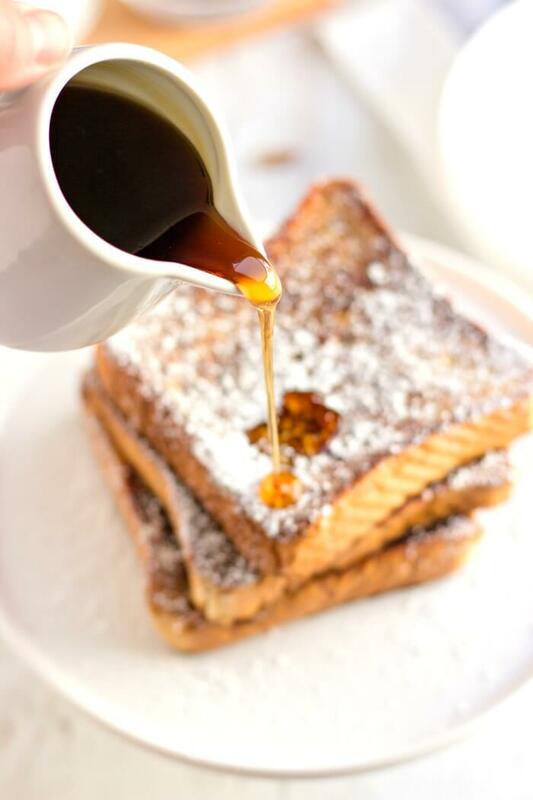 To make the best French toast, first, In a shallow dish or bowl, whisk together everything except bread and milk. Next, pour in milk and whisk a little more until everything is incorporated. Then, dip bread in wet mix, turning and coating both sides evenly. Finally, cook bread slices in a buttered nonstick skillet on medium. Flip and brown both sides. Last, dust with powdered sugar and drizzle with maple syrup. 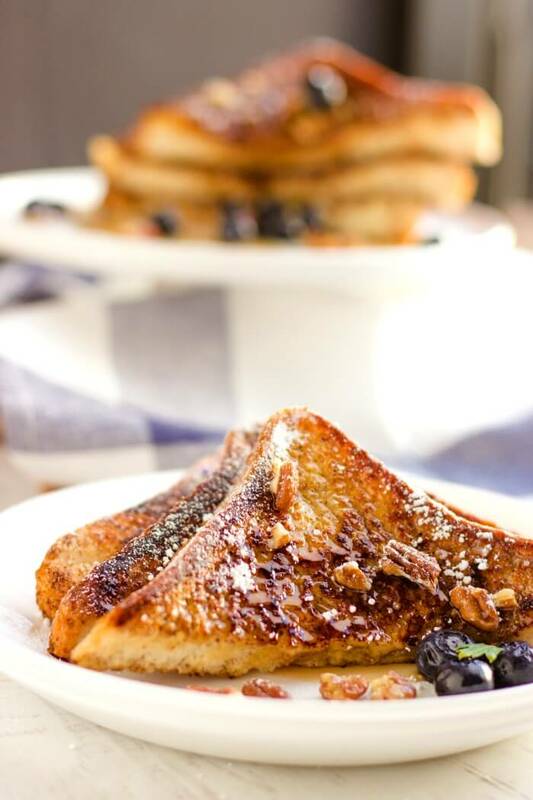 Classically French Toast is topped with powdered sugar and real maple syrup. At our house, my oldest likes whipped cream on his French Toast, while the little ones like blueberries and strawberries. I am partial to some toasted nuts and whipped butter. A hearty bread sliced thick makes the perfect base for French Toast. I like to use this French Bread recipe whenever possible, but for the most part we just pick up a loaf of thick sliced bread from the market. Folks often ask, can you make French toast with regular bread, and the answer would be yes, you can make French toast with regular bread. Just be careful not to soak to long as it may create a soggy result. To make crispy French Toast, use extra butter and get the skillet hotter than you normally would. I find cooking it in a cast iron pan helps make the edges perfectly crispy. If you find that your butter is smoking or burning because the temperature is too high, try using ghee, clarified butter, or even rendered bacon fat from making bacon in the oven. Soggy French Toast is usually the result of soaking your bread for too long. If you soak the bread to long, then it’s difficult to get the toast cooked all the way through and you will often end up with a soggy middle. You want to soak your bread just long enough to get it well wetted on both sides, but not saturated. The only time you want to saturate the bread is if you are doing a French Toast Casserole where you will put it in the oven until it is baked all the way through. French toast is not healthy, but it is also not inherently unhealthy. 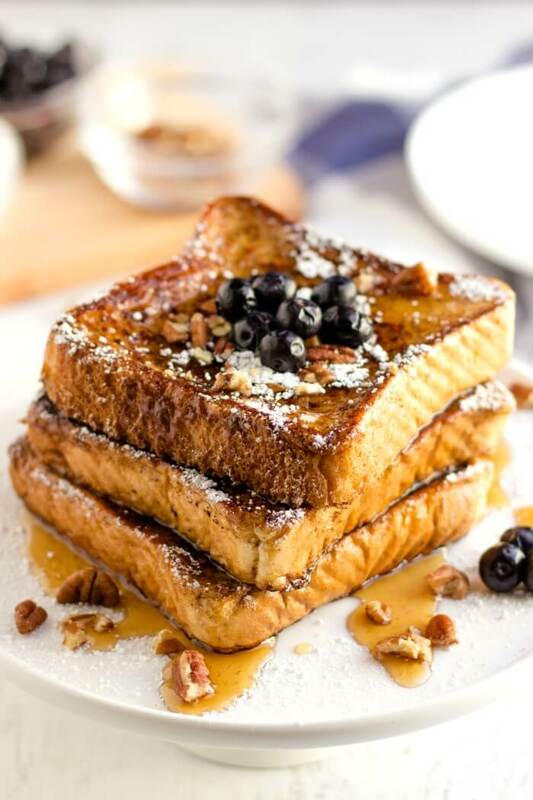 French toast has grains and carbohydrates from the bread, dairy from the milk, and protein from the milk and eggs. If you want to make your French Toast healthier, skip the added sugar and serve with fresh fruit instead of syrup. Use whole milk, half and half, or heavy cream in the batter. Don’t over soak the bread. Use butter (or ghee, or clarified butter) to cook your french toast. Make it with a thick cut, sturdy bread. French toast batter can be saved or made ahead for up to one day. If you want your morning to go quicker, make the wet mixture in the evening before bed and store it in the refrigerator overnight. Give it a quick whisk before using. Do not soak the bread ahead of time, or you will end up with a soggy mess. The only time you want to soak the bread for any extended period of time is if you are making a French Toast Casserole. French Toast can be frozen after it is cooked. Let the French Toast cool, then store it in a freezer container (preferably air tight to avoid freezer burn). Reheat in the microwave or toaster oven. I love to make a big batch on our big griddle and keep it in the freezer for quick and easy breakfasts. Tilt n Drain Griddle – This awesome griddle has a heavy cast aluminum base with premium nonstick surface assures stick-free cooking and easy cleaning! We use it for everything from pancakes, to eggs, to chicken breast, and seared steak! 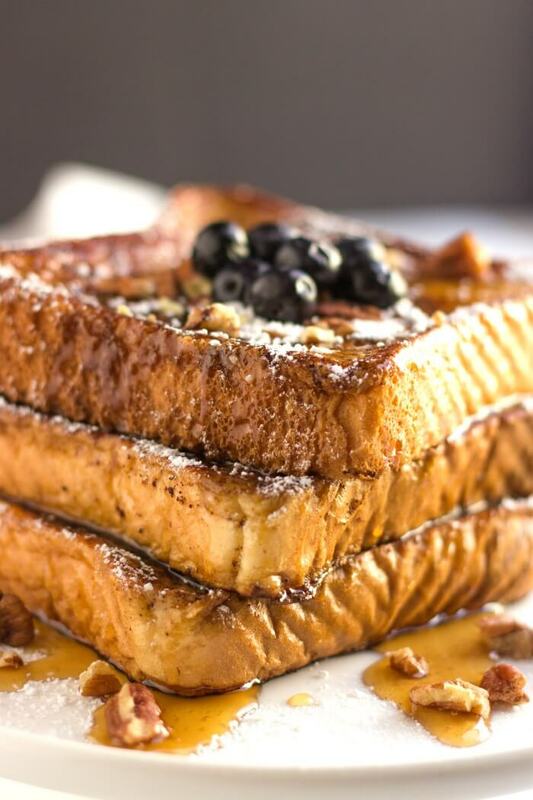 French Toast is a weekend treat at our house, and you're going to love this recipe because it's the Best French Toast you'll ever make! In a shallow dish or bowl, whisk together everything except bread and milk. Pour in milk and whisk a little more until everything is incorporated. Dip bread in wet mix, turning and coating both sides evenly. Cook bread slices in a buttered nonstick skillet on medium. Flip and brown both sides. Dust with powdered sugar and drizzle with maple syrup. We love French toast at our house! I can’t wait to make this recipe! 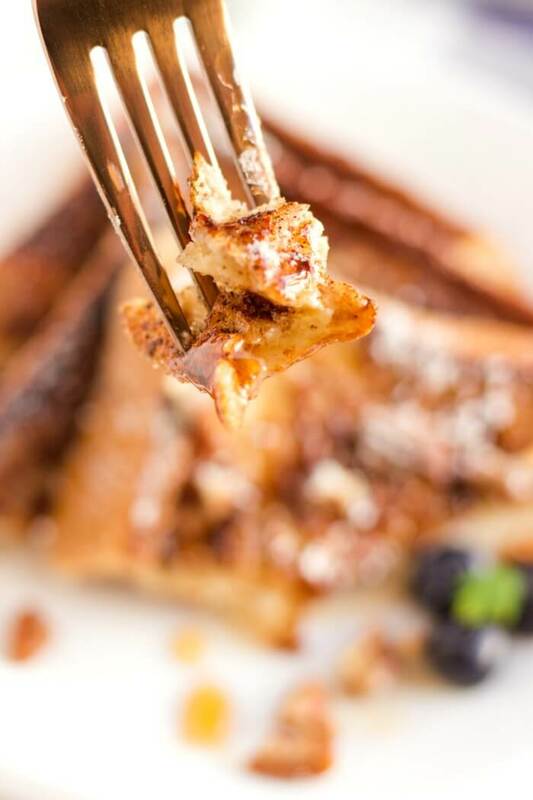 French toast is a favorite at our house! 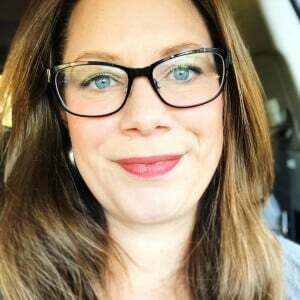 Loved all the tips in this post! I made this recipe and it’s officially the best French Toast recipe EVAH! SO GLAD YOU LOVE OUR FRENCH TOAST! A weekend favorite at our house. Love that you add cinnamon and nutmeg! These pictures have me DROOLING! I can’t wait to try your recipe! 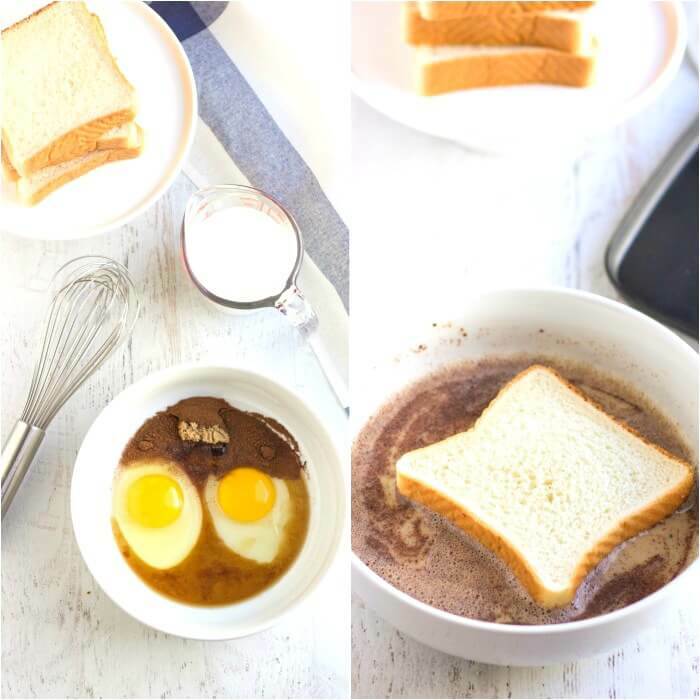 This looks like the perfect breakfast idea! The family loved this! I fixed it for Saturday breakfast! I love how easy this is! Perfect for any morning of the week and my kids loved it!